The Guardian (Mehcad Brooks) is beating up some thugs who are attacking a woman. After he beats them up, he goes to the woman he just saved. Instead of expressing gratitude, she recoils from him in horror. Lena (Katie McGrath) and Kara (Melissa Benoist) are having lunch and discussing ‘NSYNC. Kara hasn’t seen Lena in a while and is curious what she has been doing. It’s top secret, but it has to do with quantum entanglement. They must have not covered that at Kryptonian elementary, because Kara doesn’t know what that is. Lena promises to give her the exclusive on it. James: “I mean, Supergirl, Superman, they’re making a difference. They’re changing hearts and minds. They inspire people. Guardian inspires fear.” An alien woman (Dominique Toney) steps out of the crowd in what looks like a telekinetic trance. She is destroying the market. She hurls a truck at a building, but luckily, Supergirl arrives and catches the truck. At the DEO, Winn, Hank (David Harewood), and Alex (Chyler Leigh) are watching a news report, “Alien Terrorist Attack”. The attack is stirring fear in National City. The alien woman who attacked the market is a Phorian, a peaceful race that has telepathic and telekinetic powers. James offers to help, but Hank rebukes his offer, they don’t need the Guardian’s ‘skills’ for this. Lena and Rhea (Teri Hatcher) are discussing their project at dinner. Lena is having a problem powering up the portal. Rhea gives Lena a pep talk. Mon-El (Chris Wood) is walking down the street enjoying an ice cream cone when he spots his mother walking out of the restaurant. A human dealer and Brian (Josh Hallem), our favorite alien low life, are making a transaction when Guardian interrupts them. To get out of this, Brian tells Guardian where he can find the Phorian woman. Guardian goes to her house and sees pictures of her with her son. The little boy (Lonnie Chavis) walks in and sees Guardian. Of course, the little boy is afraid, but James calms him down by taking off his helmet. Marcus, the little alien boy, touches James’ face. Alex is with Marcus trying to bond with him over hamburgers. She asks him where they can find his mother. Marcus answers with silence. 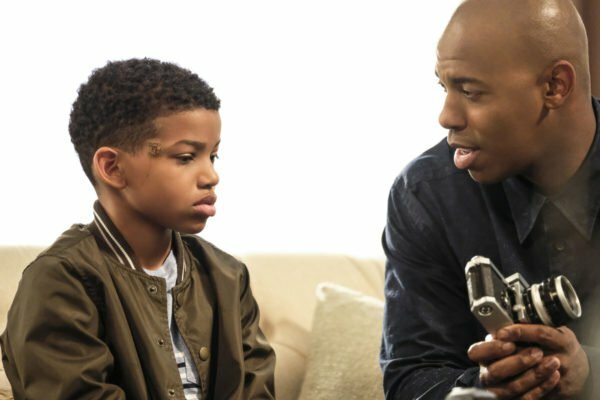 Winn has a way to get Marcus to talk. “Maybe she should give him like some action figures, right? Like if someone had given me action figures when they interrogated me about my dad when I was 10, I would have sung like a canary. I’m just saying.” James doesn’t agree with their methods of interrogating Marcus. He’s a frightened little kid, and having him in a cell isn’t helping. Alex agrees with him. Marcus identifies with James. They agree to let Marcus go with James. Hopefully they’ll bond and he’ll tell James where his mother is. Mon-El nonchalantly asks Winn how they tracked his mother’s ship to make sure she left Earth and headed back to Daxam. Winn shows him how they did it. Lena is in the lab and she still can’t get the portal to work. She admits to Rhea that she wants to prove she is as good as Lex. Rhea assures her she is smarter than he is. She encourages her not to think like Lex. Lex is all about attaining power; don’t try to get the portal to work using more power. Lena needs to use balance. James takes Marcus to CatCo where Kara greets them. Eve Teschmacher (Andrea Brooks) asks who the cute little boy is. James tells her Marcus is his nephew, and could she bring them some curly fries and shakes. Marcus checks out James’ cool office. He uses his telekinesis to move the balls in a game. Marcus plays with one of James’ cameras. James talks about his dad being a soldier; Marcus answers that his dad was a soldier too on their home planet. He died there. The two fatherless boys bond. Mon-El walks in the office with a big order of Chinese for Kara and him. He tells her he thought he saw his mother, but he checked to make sure her spaceship left Earth. He hates he still cares about her so much. Kara comforts him by saying she is your mother. Lena has figured out how to get the portal to work. 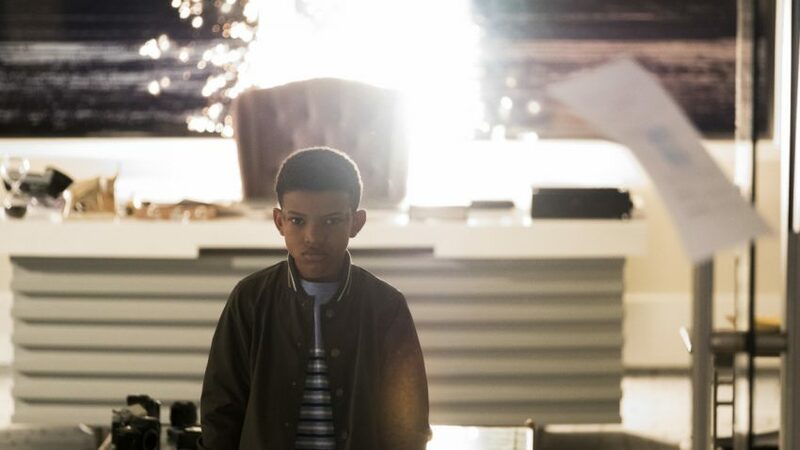 Marcus sees his mother on TV and tells James his mother would never hurt anyone on purpose. Lena turns on the machine and it activates Marcus. Marcus levitates as he lays waste to the office. James and Mon-El get the staff to safety while Supergirl swoops in and takes Marcus outside the CatCo building. Lena turns off the machine and a confused Marcus goes back to normal. Supergirl comforts the lad. Marcus is back in a containment cell that has a psychic dampener to prevent him from using his powers. The DEO really wants to find his mother and they want James to talk to him. James recuses himself; it’s a DEO matter. Hank goes out to talk to him. Marcus spotted something in him that made him comfortable. Hank knows that James is looking for a purpose. Hank found his when his daughter was born. He discovered he had a knack for protecting her and others. He joined Martian law enforcement, and they started calling him “Martian Manhunter”. The two women aren’t having a cordial conversation. Rhea blames Kara for everything. She promises that the people of Earth will suffer because of her. Mon-El gets on the phone to ask her not to blame Kara or hurt the people of Earth. This only makes Rhea angrier and she promises to wake him up. James and Marcus are holding a much more cordial conversation. He and his mom have been turned away from other planets; they thought it would be different on Earth. James tells him a story, when he was a kid he experienced bullying because he was different (black). To deal with it he build a wall around himself and kept people out. This changed for him when he moved to Metropolis and met his best friend Clark. He could tell he was different too, just not how different at the time. He let Clark in and his walls came down. Marcus can see his mother but he isn’t familiar with the place. He can take James to it. James relays the information to Hank. He thinks it could be too dangerous, he knows Marcus and his mother aren’t doing this on purpose, but they don’t know when the atmospheric energy will shift again. James reminds Hank about finding his purpose with his daughter. This is his. Winn pipes in and says he has a mobile psychic dampener they could use. Hank gives them permission to go. Marcus’ mother is in an abandoned factory. She is overjoyed to see him but apprehensive about James and Winn. He assures his mother they are his friends. To their surprise, about 12 other Phorians come out of hiding. Lena is excited for their final test. Rhea is pensive, she tells her, “Whatever happens next, I want you to remember never to doubt yourself again. You are a marvel, Lena. Any mother should be proud to call you daughter.” To Lena’s surprise, Rhea turns on the portal. The DEO spots the spike in atmospheric energy. Kara and Mon-El prepare to face Rhea. Winn turns on the psychic dampener but it doesn’t work. It wasn’t designed to handle these many Phorians. Winn tells James they have to go, but James won’t leave Marcus. Since the Phorians seem to be psychically connected, if he can get to Marcus, maybe it will get the others to stop. James convinces Marcus how strong he is, he is able to get through to Marcus and all of the Phorians are able to fight the spike. James is a hero. James Olsen became Guardian because he didn’t want to be a sidekick; he wanted to be a hero. What is a hero? Does a hero have to be someone who is big and strong and beats the crap out of the bad guy? In comic book shows that is great, but can one be a hero another way. James finds out in this episode that you can be. When the episode began, dressed as Guardian, he protects a woman, but his fierce outfit and violent behavior made him as frightening to her, as the criminals were. Why would James feel like he had to take on a persona like this to fight crime, to be a hero? I can understand why Batman or the Green Arrow took on their personas. Bruce Wayne because of the loss of his parents to violence, and Oliver Queen because he spent five hellish years on that island. Their traumatic experiences broke something in both men, so dressing up and fighting crime at night doesn’t seem that odd to them. For James, what we know of him, it never made sense. He finally starts questioning himself if he’s made the right decision. In meeting Marcus, James begins to see another way to be a hero. Not one that only deals in might, but one that deals in compassion and love. Rhea told Lena not to try to be her brother and try to find a solution through power, but to find her own way through balance. Great advice from an evil person. James finding a different way to be a hero saved the day. The best scenes from the episode were between, James and Marcus, Hank and James, and Rhea and Lena. In these scenes, we see the older person be a mentor to the younger one. James advising Marcus to tear down his walls to let other people in to his life. Hank advising James to find a purpose and knowing that James saw a reflection of himself in Marcus. Rhea in encouraging Lena, and letting her know she was smarter than Lex and that she should believe in herself. It’s too bad Lena betrayed her, because if Rhea weren’t evil, she would be a great mother figure for Lena. The episode wasn’t action heavy, but the scenes that were action oriented were well done. Any time that the Phorians would go into their telekinesis trance, the destruction they caused looked good. The final scene of the Daxam fleet coming through the portal and hovering over National City was movie quality. I know most people weren’t looking forward to a James Olsen centered episode, but it was well done. Special mention has to go to Lonnie Chavis who played Marcus. He made his scenes with James touching. I’m glad they gave this episode to James. He has been on the periphery most of this season. I hope they find a natural way to include him in the show next season.